Since late Spring, Narragansett Bay and coastal shorelines have been tight with bait supporting many species of predator fishes. Silversides are technically Atlantic silversides. They prefer seawater temperatures around seventy degrees and for survival or spawning, will hold in grasses and shallow waters. Slender and beautiful, they appear similar to anchovies with the exception of their slightly smaller mouths. Slinking through the inter-tidal zone and areas close to the shoreline, they feed on zooplankton, small squid, crustaceans and the occasional shrimp. According to Save The Bay’s The Uncommon Guide to Common Life on Narragansett Bay, they’re the most abundant fish in Narragansett Bay. If you’re fishing a salt marsh or saltwater river, you’ve likely heard big fish slamming through schools of silversides, often in waters far more shallow than you may have expected, which happens more after sunset. Most seasonal predators will target them, hence their amazing white and silver camouflage skin colors meant to save their own skin. Sand eels are not eels at all, they’re Northern sand lances but have been incorrectly named as their swim patterns mimics eels with their distinctive side to side undulations and similarly pointed snouts. Sand lances average about four or five inches long and will use that snout to burrow into soft, small grain sands to avoid predators. Like the bluefish that prey on them, they’re known to feed on their own young. Sand eels are what all those fat seals are targeting, which is what all those amazing white sharks are targeting out on Cape Cod and recently closer to our own shores. South County shark spotter and Point Judith fishing royalty, Wayne Davis, has taken some amazing pictures from his airplane of tons of seals feeding on sand eels along the Cape. Lances were schooled up so thick they looked like someone took a Sharpie to the picture and smudged out part of the shoreline. 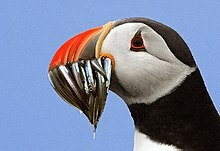 They’re also heavily consumed by porpoises, puffins and other migratory birds. Because they move along like eels, your imitations need to closely mimic their sultry moves. Lure designer Bill Hurley makes awesome sand eel soft baits impregnated with real mackerel and sand eel oils and there are several fly patterns out there, including the Theo’s and the Corsair. As is true with most “hatch” type fisheries, it’s important to have a few variations in your tackle bag if you want to get in on the action. 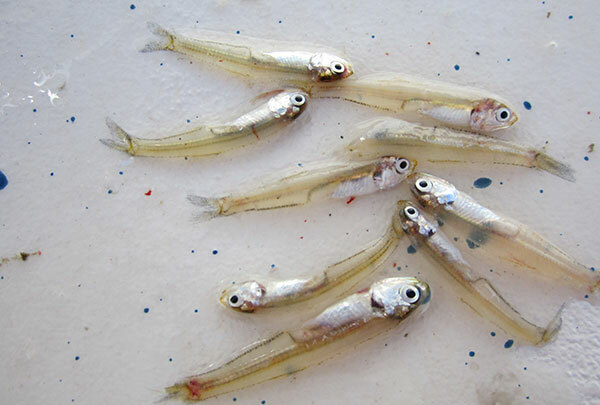 Peanut bunker are juvenile Atlantic menhaden who were spawned along the coast and then rode ocean currents to grow in the relative safety of local estuaries. They’re beautiful little fish who grow to about a foot long and have distinct black dots behind their gill plates. Traveling in large schools and remaining here in big numbers until waters begin to cool, the ones we’re seeing this summer are those one year olds heading back to sea. 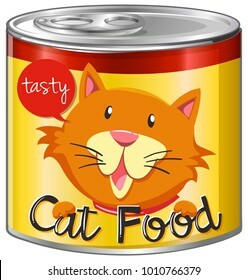 As they feed on zooplankton, lots of predators are looking for them as a source of proteins and fatty natural oils, which is also why human predators drag for them by the millions for lobster bait, cat food, nutritional supplements and that all-important lipstick. A few times over the last few winters, Captain Jerry Sparks and I have witnessed summer-like blitzes of holdover stripers attacking schools of peanuts, making for a surreal fishing experience with snow in the air and fleece gloves on our hands. Peanut bunker are often live-lined to catch stripers; some local kayak fishermen have mentioned using that same method to catch Atlantic bonito. The Fish Whisperer, Tim Benoit, used to swing a giant rubber version of an adult menhaden, bouncing it along the bottom of Galilee’s channel, which surely was no easy task. The hook was so huge that only the biggest stripers dared to attack it and, no surprise, those were the ones he caught. Bay anchovies are Anchoa mithillia and inhabit western Atlantic from Maine to Cancun. That’s a reach. They hang in shallow areas with decent structure, travel in schools to reduce predation while feeding on zooplankton and can somehow handle hard, sandy or muddy bottoms. They seem to spawn all summer right into early fall season and with their short heads supporting relatively short snouts all balanced with a slight pretty green color, they’re easily confused with the striped anchovy. Fluke fishermen favor anchovies for their rigs to complement so many beads and bling. Shops are full of imitations for these common bait fishes so when bass are on one species, we need to make the most of our casts. Al’s Goldfish Saltwater Series, the trusty Kastmaster and Hurley’s eels all provide sufficient shimmy to draw big fish away from schools of the real deal. And as long as this coastline stays warm, bait fish will be on the run from those big predators waiting to be caught and released by all us fishermen.